getcalc.com's Fractions & Mixed Numbers Average calculator is an online basic math function tool to find an equivalent fraction for the average between two or more fractions with same or different (equal or unlike) denominators, positive or negative fractions, regular or irregular fractions, mixed numbers and whole numbers. This calculator also featured to generate the complete work with steps for any given valid input values to assist elementary or grade school students to solve the fractions average worksheet or homework problems effectively. Thus, users can generate the step by step calculation for the corresponding input values or verify the similar calculation results by using this fractions & mixed numbers average calculator. Average of Multiple Fractions is a basic arithmetic operation used to find the average between two or more fractions with same or different (equal or unlike) denominators, positive or negative fractions, regular or irregular fractions, mixed numbers and whole numbers. 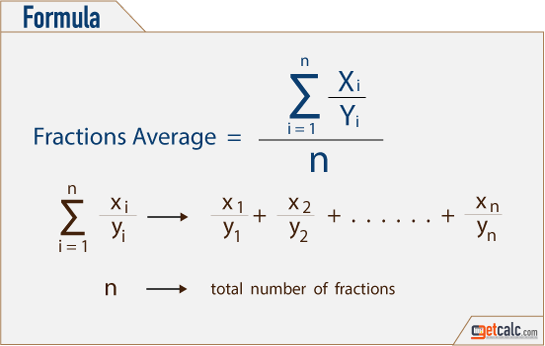 The below formula is the mathematical representation for average of multiple fractions with like or unlike denominators, positive or negative fractions or mixed or whole numbers. The below solved example with step by step calculation or workout may help users to learn how to find the average of three fractions with unlike, unequal or different denominators. Find the average of fractions 1/2, 1/3 & 1/4. (1/2 + 1/3 + 1/4)/3 = ? step 2 To find the sum for fractions with different denominators, find the LCM (least common multiple) for all denominators. 12 is the LCM for 2, 3 and 4.
step 4 Simplify the above expression to bring same denominators for all fractions. step 6 Divide the sum by total count of fractions. Thus, 13/12is the average of three fractions 1/2, 1/3 & 1/4. The below solved example with step by step calculation or workout may help users to learn how to find the average of three fractions with same, equal or common denominators. Find the average of fractions 5/9, 6/9 & 7/9. (5/9 + 6/9 + 7/9)/3 = ? step 2 Find the sum of all fractions. Thus, 2/3 or 0.66 is the average of three fractions 5/9, 6/9 & 7/9. The below solved example with step by step workout may help users to learn how to find the average of multiple regular or irregular fractions with like or different denominators and whole numbers. Find the average of fractions & whole numbers 2/3, 3/4, 6, 4/5, 3, 5/6 & 8/9. 2/3,3/4,6,4/5, 3 ,5/6,8/9 = ? step 4 To find the sum for fractions with different denominators, find the LCM (least common multiple) for all denominators. 180 is the LCM for 3, 4, 1, 5, 1, 6 and 9.
step 6 simplify the above expression to bring same denominators for all fractions. step 7 add all numerators and rewrite it in a single form. step 8 Divide the sum by total count of fractions. Thus, 2329/1260 is the average of fractions & whole numbers 2/3, 3/4, 6, 4/5, 3, 5/6 & 8/9. The below solved example with step by step calculation may help users to learn how to find the average of multiple whole numbers, positive & negative fractions (with unlike or different denominators). Find the average of multiple whole numbers, positive & negative fractions 2/3, 2/4, -2/5, 6, 2/7, -3/9 & 2/9. (2/3 + 2/4 + -2/5 + 6 + 2/7 + -3/9)/6 = ? step 4 To find the sum for fractions with different denominators, find the LCM (least common multiple) for all denominators. 1260 is the LCM for 3, 4, 5, 1, 7 and 9.
step 7add all numerators and rewrite it in a single form. Thus, 431/315 is the average of multiple whole numbers, positive & negative fractions 2/3, 2/4, -2/5, 6, 2/7, -3/9 & 2/9. Find the average between multiple fractions, mixed & whole numbers 2/3, 4/5, 6/7, 3(8/9), 6(1/2) & 9. (2/3 + 4/5 + 6/7 + 3(8/9) + 6(1/2) + 9)/6 = ? step 5 To find the sum for fractions with different denominators, find the LCM (least common multiple) for all denominators. 630 is the LCM for 3, 5, 7, 9, 2 and 1.
step 7 Simplify the above expression to bring same denominators for all fractions. step 8 Add all numerators and rewrite it in a single form. step 9 Divide the sum by total count of fractions. Thus, 13193/3780 is the average of multiple fractions, mixed & whole numbers 2/3, 4/5, 6/7, 3(8/9), 6(1/2) & 9.